Markkanen disappearance on offense the last half of the season has changed the possibilities of this team making any kind of run. Imagine Alkins, Markkanen, and Simmons as seniors.... it OK to imagine, isn't it? Kobi gets hammered .. but gets called for the foul ? Simmons is lost in his HighSchool Days! Trier hits Ristic in the paint for the bucket. And the Buffs have the lead. Colorado's Johnson hits his first FT to tie the game. Co kid has ice in his veins. But Co is playing incredibly well. Cats, not so well, but they are still leading. Slow reaction time by Arizona. This team just makes me a bit crazy. Just never know what to think. Arizona calls a timeout here, leading 36-35 with 1:02 left in the first half. Derrick White hits a trey to cut UA's lead to just one point. Trier trying to take this game over for the Cats. Josh Fortune responds on the other end with a triple. Trier with a beautiful shot there. Buffs are a grindingly team. Cats need to listen to their coach. Chance, throw it down young man! Colorado hasn't made a field goal in 2 minutes 50 seconds. #ArizonaWildcats Markkanen's 3 at 9:27 of first half only Wildcats hoop until Trier lay at 3:35 as #Colorado goes to 2-3 zone. It's 30-25. We seem to play quicker with Pinder in. Arizona, the best free-throw shooting team in the Pac-12, is 4 for 8 from the line so far tonight. Colorado is 7 for 10 from the line. AAAGH! In March, YOU....MUST..MAKE..YOUR... FREE THROWS! Trier is the first Wildcat in double digits. He's got 10 points. At the media timeout, Arizona leads 30-25 with 3:07 left in the first half. The Cats outside shooting is their achilles heel. 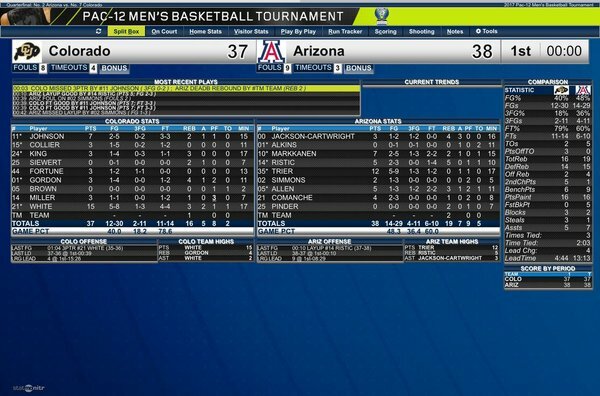 #ArizonaWildcats end 4:07 scoring drought with 1 Trier FT. Lead down to 28-25. What is the foul count? This team is so weak. I don't know why we're going backwards at the worst possible time. All they need to do is run a zone and they'll really throw them off. Everyone is waiting for Trier to shoot. Both teams are in the bonus.